Mix flour, salt, baking powder in a large bowl. In a separate bowl, beat eggs until well mixed, then add to the dry ingredients. Add oil, juice and vanilla, and nuts and stir until just combined. Allow dough to rest 10 min. Shape dough into two long rolls, approximately 1” in diameter and place on a cookie sheet. Press each roll to flatten on top, brush with a little beaten egg. Bake 30 min at 350° F. Remove from oven and allow to cool slightly (just enough to handle). With a serrated knife, cut the loaves on a diagonal into bite-size slices. Place the slices back on the sheet pan and toast until golden brown, about 5-8 minutes. Allow cookies to cool completely before dipping in melted chocolate. Coffees with nutty nuances such as Colombia Narino Supremo and House Blend team up well with toasty nuts and cocoa flavors. The savory chocolate-dipped hazelnut biscotti creates an uninhibited chemistry between the pairs. 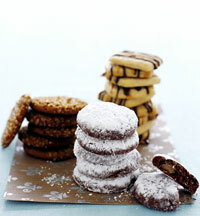 These crisp cookies, made with fresh ginger and molasses, are perfect for decorating. Puree the ginger in a mini food processor with 2 tablespoons water. Squeeze and strain juice through cheesecloth or a fine mesh strainer. Discard the ginger pulp. Reserve the juice. then whisk in the pepper; set aside. Cream the butter and sugar with a handheld mixer until light and fluffy, about 1 1/2 minutes. Add the molasses and ginger juice and beat until evenly incorporated, about 2 minutes. until you have a crumbly mixture. Bring the dough together by hand pressing and kneading lightly until moist, but not tacky. Divide into 2 equal portions, press into disks about 1/2-inch thick. Wrap in plastic and chill for at least 1 hour or overnight. Position racks evenly in the oven and preheat to 350 degrees F.
Dust the dough and a work surface with flour. Roll the dough about 1/4 inch thick. Cut out cookies into desired shapes. Transfer to a parchment lined baking sheet. Bake until the cookies are a rich tawny brown, about 18 to 20 minutes. Cool on a rack. For decorating: Whisk the water and egg white powder in a medium bowl until foamy and smooth. Gradually whisk in the confectioners\’ sugar to make a smooth icing. and add a food coloring as desired. Spread or pipe the icing onto the cookies. Finish with sprinkles, or candies. Let rest on a rack until the icing sets, about 30 minutes. • For a chewier cookie, roll them 1/3 to 1/2-inch thick and bake for 16 to 20 minutes. • Decorating holiday cookies is a great way to indulge your creative spirit while making something sweet. Crushed candy canes and chopped nuts are perfect holiday stand-ins for sprinkles and dragees. • When adding food coloring to royal icing, add it slowly, drop by drop. Since it\’s potent stuff, your icing could quickly resemble a neon light. • If you don\’t have a pastry bag and tip, use a plastic sandwich bag. Drop icing into the bag, push it to the corner, and snip off the corner tip. A unique and tender cookie favored by both Jewish and Middle Eastern bakers alike. Try making them with all three delicious fillings. Puree the filling ingredients in a food processor until evenly combined, about 1 to 2 minutes. Remove and set aside. Clean the processor bowl. food processor and pulse 3 to 4 times to mix. Add the butter, oil, and milk pulsing until the dough just comes together. Take care not to overwork the dough; it will be slightly wet. Remove dough from the processor, and roll into 20 equally sized balls. In the palm of your hand, press and pat each ball of dough into a 2 3/4-inch round. Place a rounded teaspoon of filling in the center of each round and draw the edges up and around the filling. to make a smooth round ball. parchment-lined baking sheet. Repeat with the remaining dough and filling. taking care not to pierce the dough to the filling. beginning to turn slightly golden, about 25 to 30 minutes. Dust generously with confectioners\’ sugar, cool and dust again. Puree in a food processor until evenly combined. 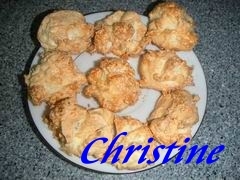 Cook\’s Notes• Take care not to overcook these cookies; the baked dough should be very pale and tender. These unique cookies are great when cooked on a griddle. Similar to a sweet scone with currants, they\’re perfect for an impromptu tea. Whisk the flour, sugar, baking powder, zest, nutmeg and salt in a medium bowl. Rub in the butter with your fingertips until the mixture looks sandy. Stir in the currants. Beat the eggs and 2 tablespoons of the buttermilk together. Stir into the dry ingredients to make a shaggy dough, add more buttermilk if the dough is dry. Gather dough into a disk, wrap in plastic wrap and refrigerate for 1 hour. Roll the dough on a floured workspace into a piece about 1/4-inch thick. Cut into 2 to 3- inch rounds. Heat a griddle or frying pan over medium-low heat. Brush the pan surface with butter. Cook the cookies until slightly brown and cooked through, about 4 to 5 minutes on each side. Transfer to a rack, sprinkle with sugar and cool. Store in a cookie tin. but take care not to overwork the dough or they\’ll come out tough. A great make-ahead freezer dough that will impress all your guests throughout the holiday season. For the vanilla dough: Mix the 2 sugars and the salt together in a medium bowl. In another small bowl, whisk the egg and mint extract and set aside. With a hand held mixer beat the butter until smooth in a large bowl. about 1 to 2 minutes. Stop mixing and scrape down the sides of the bowl. Add the egg mixture and beat until smooth. Gradually add the flour, mixing slowly until blended. Turn the dough out of the bowl, divide in half. Place the halves between 2 pieces of lightly floured parchment or waxed paper. Roll into a 10 by 12 by 1/4 inch rectangle. and refrigerate until firm, about 2 hours or overnight. Whisk the sugar, cocoa, salt in a medium bowl. While mixing, add the cocoa mixture, and continue beating until lightly colored and fluffy, 1 to 2 minutes. Stop mixing and scrape down the sides of the bowl. Add the egg and beat until smooth. onto a baking sheet, and refrigerate until firm, about 2 hours or overnight. Put 1 of the chocolate doughs on the workspace and remove the top sheet of parchment. place the vanilla dough on top of the chocolate dough. Take care to line up the edges of the 2 doughs and trim as needed. Lightly press to smooth and seal the doughs together. Remove the top piece of paper. Brush the surface of the dough lightly with cold water. Position the sandwiched doughs with the long edge facing you. Using the edge of the paper as a guide, roll the doughs into a tight cylinder, 2 inches wide. Wrap in plastic and refrigerate for 1 hour. Repeat with remaining 2 sheets of dough. Evenly position racks in the oven, and preheat to 325 degrees F.
Slice the dough crosswise into 1/4-inch thick cookies. Lay about 1/2-inch apart on parchment-lined baking sheets. Bake until just golden – not too dark you\’ll lose the definition of the spiral, about 14 to 16 minutes. • For the perfect spiral, make sure the first roll is very tight. If there are gaps, they will show up in the final cookies. If the dough gets too soft, simply refrigerate until malleable but not so dry that it cracks.